Sir Terry Leahy, environmentalist extraordinaire or tough CEO of a global fortune 500 company driven by increasing shareholder value? Listen to Sir Terry's speech at the Politics of Climate Change Conference ahead of the Copenhagen Earth summit in Nov 09 you may think the former option. Look at Sir Terry's track record at managing cost at Tesco you would think the second. 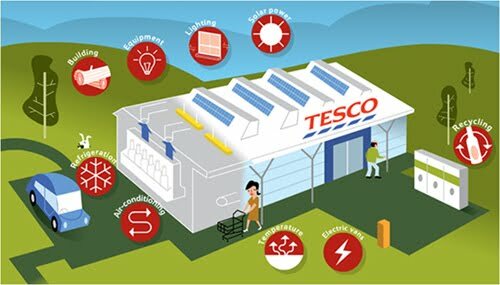 Could it be that the two versions are compatible and that because Sir Terry is watching the bottom line in everything Tesco does, the environmental measures Sir Terry has initiated, such as Eco-stores, are more relevant? For if Eco-stores are just a marketing stunt then it will provoke a backlash from the very consumers Sir Terry is wooing, but if Eco-stores are a real step towards a more sustainable future then the influence this will have on a still skeptical business world will be massive. It must be said that Tescos target of a zero carbon business by 2050 is sufficiently far away to not put too much pressure on Sir Terry to deliver on the promise but if the seed Sir Terry is sewing in the business world at large grows to become a 'race for green' then we may see substantive change sooner than the cynics or even Tescos themselves had foretold.